Nationwide engaged Principle to develop their new interior concepts, encompassing a number of strategic projects from retail network to alternative retail formats. 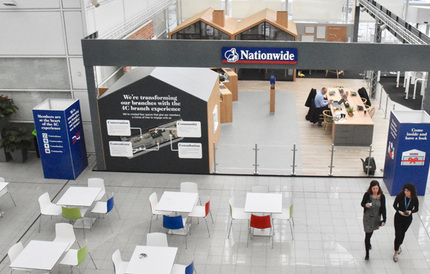 As an immediate and high profile project, our team worked closely with Nationwide to provide a full turn key solution for their new 4C brand experience temporary branch. Principle managed all stages from strategy and design development, to production and implementation across a 5 week period. Based at Nationwide’s head office in Swindon, the branch continued operation as normal without any interruptions thanks to the installation of this temporary solution. This latest roll out offers an impactful retail model, creating temporary solutions within shopping centres, university campus sites and events with ease.